Description: Mangave 'Bloodspot' (or 'Blood Spot') is a gorgeous intergeneric hybrid (nothogenus) of arguable origin that seem to be originated in Japan crossing Agave macroacantha × Manfreda maculosa. 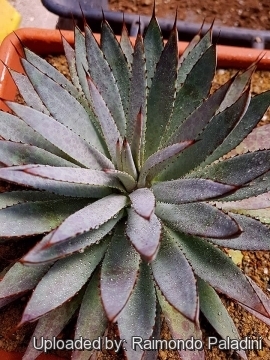 Leaves: Succulent, stiff, lanceolate, 20 cm long by 2,5 cm wide, dark green when young then grey-green and heavily speckled with cranberry red spots, edges maroon with tiny, bright red teeth and a small terminal spine. Leaf imprints only on the back of the leaves. The contrast of colours is most prominent when plants are grown outside exposed to the sun. 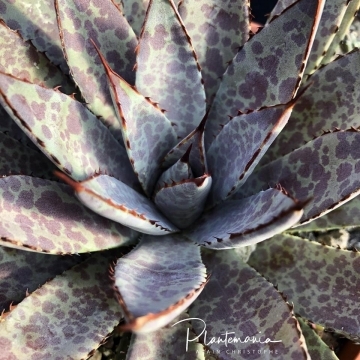 As the plant mature approaching blooming time, the leaves in the centre become lighter, less speckled and a cool, pale blue-grey colour while the outside lower leaves still look blood speckled. Flowers: Brown with exserted stamens. 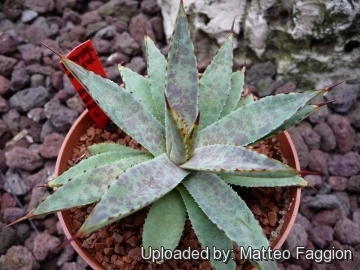 Remarks: In the recent Joachim Thiede combined Polianthes (Tuberose) and Manfreda into Agave, thus making the Mangave” actually an interspecific Agave hybrid. Cultivation and Propagation: It is a relatively easy-to-grow plant. Seems pretty wimpy in hot, blazing sun, but does great in partial sun to shade. 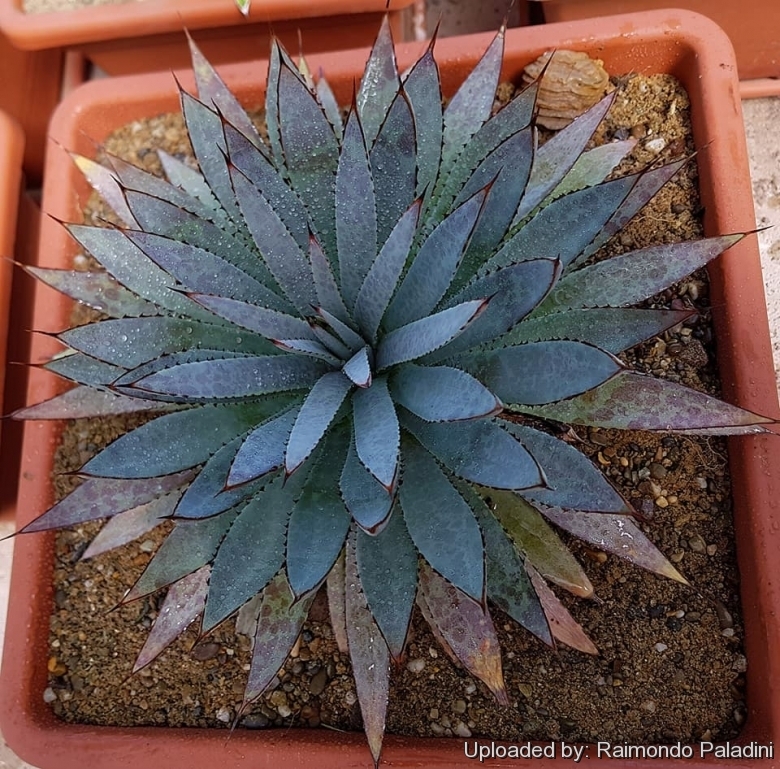 It is relatively cold sensitive for an Agave, Just a light freeze (-2° C) for an extended period can burn some leaves (but can survive to at least – 6°, particularly when dry, even though portion of a mature plant can ‘melt’)... but it's too beautiful to risk not covering it on cold nights. Need a very well-drained, soil. It grows fairly fast in summer if provided with copious water but allows to dry thoroughly before watering again (the more water and fertilizer this plant gets the faster it will grow). During the winter months, one should only water enough to keep the leaves from shrivelling. Remove suckers to show of the beauty and form of the individual rosette. Propagation: Most of the plant in cultivation are clones obtained from micropropagation, as this cultivar rarely suckers. If suckers will be available remove them in spring or summer and let the cuttings dry for a few days before inserting in compost. It may also propagate by bulbils found on the floral stalk.